Kawasaki KH400 triple, the cutting edge of the mid seventies. Most young motorcyclist of the seventies coverted certain dream bikes, from Honda's CBX to Kawasaki's range of triples, the latter being more realistic to a teenager. The triples were the must haves, they seemed futuristic with their small capacity triple cylinder engines and wild paint jobs, I'd have sold my soul for a KH250. And now 30 years later I have one, not a 250 but a 400, I'm transported back to the seventies when ever I stand and stare at it, now where is that The Rise And Fall Of Ziggy Stardust And The Spiders From Mars album? As you can see it's gorgeous, can you believe it's 30 years old? it runs as well as it looks but is a completely different sort of ride than that of a modern bike with brakes that don't stop you, they just slow you down. So how did I become the owner of this triple? Well I decided I wanted a seventies Japanese classic that was affordable yet different, did not need too much work doing to it as I wanted to ride it rather than have it in my garage for years whilst seeking parts, a bike that was part of my youth even though I never owned one and of course it had to be attractive and so looking through Classic Bike magazine I decided on a triple. The first one I picked out I actually bought. The above is visually not far from the condition I bought it, a credit to the previous owner who had it for 15 years, he bought it in a box of bits and with the help of others rebuilt it to almost the standard shown. I have done plenty of work and spent double the money against what it cost me to eventually get it right, I have sorted the leaks, the brakes, the carbs, the oil pump, the switchgear, the mirrors, electrical faults, replaced the stanchions, the rear shocks, the casings, the tank, refurbished the clocks, changed bearings and bushes and used plenty of Autosol and elbow grease, the list goes on and will be never ending as I source better parts than the ones that are fitted. O.k. it looked pretty decent when I bought it and that is why I bought it, but now it is even better, maybe outstanding? it runs so well and the nightmare stories one hears about handling are a little exaggerated, now I'm going to do what Kawasaki made it for and that is... to ride it. 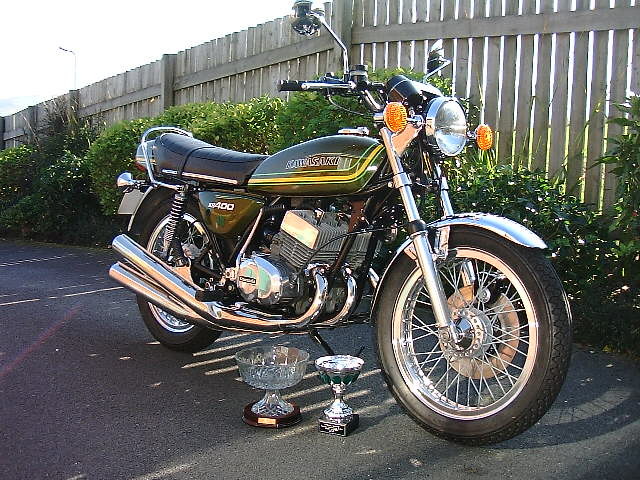 The KH400 A3 wins 'BEST IN SHOW' at The Nabs Head Classic Bike Show 2003. Here we are showing the trophy and our winning KH400 at Rivington Barn after the event on the Sunday afternoon. Suddenly all the work and pain of bringing this bike back to original condition was worth it. Thanks to the regional VJMC-UK for organising the event with Nabs Head and the sponsers M & R Motorcycle Bench's. A fantastic day. At home on the drive a few days after the Swansea Classic Bike Show, another win another trophy. The KH is looking so good but I refuse to lock it away just to bring it out for the annual local bike show, no it gets used through spring, summer and autumn and can be seen regularly at Mumbles or Porthcawl. Another win, Swansea Classic Bike Show, 'Best Modern Classic', 25th Sept. 2005, then another trophy on the 24th Sept. 2006, 'Special Award'. Having completed the KH400 I was now hooked on classic Japanese motorcycle restorations, what else would I consider to be a challenge? A rare Suzuki with a rotary engine? Click on 'Kawasaki Triples' below or the 'glow button' for more close ups of this outstanding motorcycle. Disclaimer......No animals were harmed in any way in the creation of this web site. Go on click it, you know you want to. And see more quality detailed photos of this classic triple.